I love making beautiful things. 'Peopleware' is a surprising book. You pick it up expecting a dry tome about (as the subtitle says) productive projects and teams. I only started to read it on the recommendation of a friend, and I'm so glad I did. It's a classic of software development for a reason. It grips you from the very first page as the authors Tom deMarco and Tim Lister lay out a problem familiar to everyone at work - "politics" - and what can be done about it. Peopleware is by turns scathing, hilarious, and wildly optimistic about making the workplace somewhere that's actually fun to be. It's stuffed with war stories that ring very true to anyone who's been stuck in a dysfunctional work environment. Peopleware is everything you hope a project management book could be, and more. Peopleware even recommends my favourite book of all time, 'A Pattern Language' (I once dreamed of becoming an architect - this book was the wellspring of that desire) as a sourcebook for designing a good work environment. I finished Peopleware in a single delighted afternoon. Here's my mindmap of the first few chapters. The widely held conviction among people who deal with any aspect of new technology (as who among us does not?) that they are in an intrinsically high-tech business. They are indulging in the illusion whenever they find themselves explaining at a cocktail party, say, that they are "in computers", or "in telecommunications," or "in electronic funds transfer." Just between us, they usually aren't. The researchers who made fundamental breakthroughs in those areas are in a high-tech business. The rest of us are appliers of their work. We use computers and other new technology components to develop our products or organise our affairs. Because we go about this work in teams and projects and other tightly knit working groups, we are mostly in the human communication business. Our successes stem from good human interactions by all participants in the effort, and our failures stem from poor human interactions. Even from that small excerpt, you can discern the warm, conversational and down-to-earth style of the book, and the rational sense it makes. Of course it's still relevant today - human interaction hasn't changed very much since the Eighties (or since the dawn of time). It dissects the multifarious ways workplaces can become dysfunctional (beware the Furniture Police!) and then lays out ways to cultivate jelled teams - groups of people excited to work together, who can focus at work, and who create amazing things. Peopleware is such a good book people are still talking about it, elaborating on it and recommending it today, thirty years after it was written. I discovered after I read it that it's the first book on Joel on Software's Programmer's Bookshelf. Joel says, "I can't recommend this book highly enough. It is the one thing every software manager needs to read... not just once, but once a year." It's also one of Kevin Kelley's 'Cool Tools'. It's that kind of book. Don't just take my word for it. 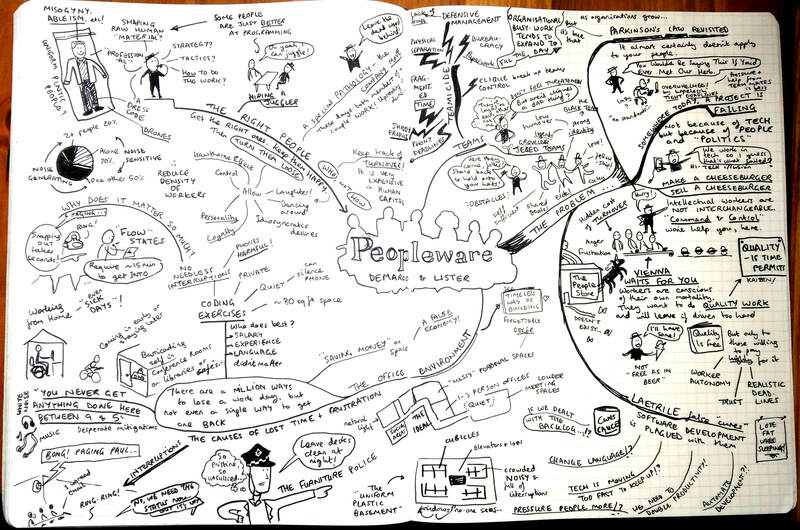 Go and read Peopleware! It'll be time well spent.